Can Venezuela survive another Maduro victory? His expected election win Sunday will likely mean more pain, trouble and repression for the country. As Venezuelan President Nicolas Maduro seeks another six-year term Sunday, it’s clear that he – like the rest of the country – is running on empty. Oil-rich and wealthy just a few years ago, Venezuela today is being gutted by hyperinflation, food shortages, collapsing infrastructure, international sanctions, growing protests and an exodus of the desperate. 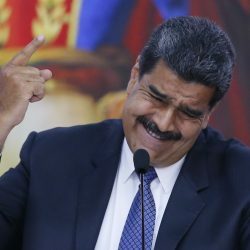 Maduro is expected to win Sunday’s vote, which is being decried as fraudulent by the international community, in spite of opposition calls for a boycott. And analysts expect that will mean more pain, trouble and repression for the struggling South American country. “Nations don’t reach bottom. There is always further to fall,” Phil Gunson, an analyst with the Crisis Group, said at a conference at the Adrienne Arsht Latin America Center in Washington, D.C., Thursday. And yet it’s hard to imagine how that change might come. During the campaign, Maduro has vowed to use his next term to pull out of the economic death spiral that many people blame him for starting in the first place. But during his campaign, he’s been doubling down on the same failing policies, taking over the country’s largest private bank, Banesco, forcing companies to slash prices and expropriating others. It’s hard to imagine Maduro, a former transportation worker, changing his economic playbook after the election, Gunson said. “Maduro, the bus driver, is going to drive the bus over a cliff,” he said. Maduro’s main rivals in the race are Henri Falcon, the former governor of Lara State, and Javier Bertucci, an evangelical pastor. While some polls give the men the lead, their chances are being hurt by opposition calls for a boycott. Many in the opposition see Falcon and Bertucci as electoral fall guys, in the race to grant legitimacy to a deeply flawed process. And the international community is treating Maduro’s victory as a foregone conclusion. The United States, Canada and the European Union have said they won’t recognize the election results. If Maduro was hoping the election might buy him some breathing room, he’s badly mistaken, said Maria Corina Machado, a former opposition deputy and presidential candidate who has been barred from running for office – along with many of Maduro’s serious rivals. “If he had any legitimacy left after he supposedly won in 2013, that’s gone beginning on Monday,” she said. It’s hard to imagine things getting much worse in Venezuela. Five-digit inflation has decimated purchasing power and led to widespread hunger. International sanctions are keeping the government from renegotiating its debt. Oil production – the country’s economic lifeblood and virtually only source of foreign revenue – has collapsed about 40 percent since Maduro took office. During the cash crunch, water and power outages have become commonplace. Hospitals often have little more to offer than aspirin. Crime is rampant. Maduro is hoping to quell the crisis by calling for talks with the opposition or, perhaps, forming a “unity” government that might include dissenting voices. But the opposition has been burned in the past by such offers. Negotiations last year in the Dominican Republic helped take the pressure off Maduro, but produced no tangible results. And a unity government would work only if Maduro agreed to obey the constitution and signaled his willingness to abandon power, Mejia said. Sunday’s elections have also cast a light on the opposition’s internal divisions: While some are backing the boycott, others have decided to support Maduro’s long-shot rivals. Eldery Alfonzo, a 30-year-old administrative assistant in Caracas, said he was going to vote for Bertucci, despite opposition warnings that such votes legitimize a broken electoral system. “You never know if your vote will be counted but at least those of us who vote know in our hearts that we tried to do something,” he said. 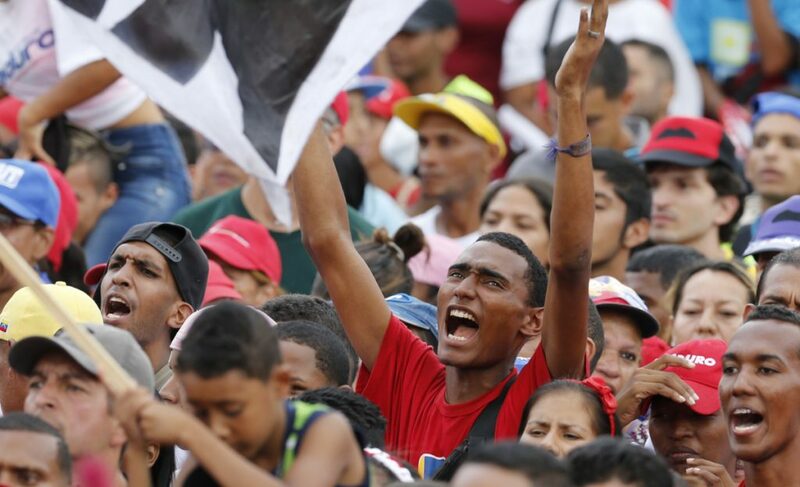 But if the opposition wants to be truly viable again, it needs to rebuild its organization, craft a clear message and find new, younger and “inspiring” leaders, said Oscar Valles, head of the political science department at the Metropolitan University in Caracas. “Without those three elements, the Venezuelan opposition will continue wandering through this hellish desert,” he said. Barring a strong opposition, Maduro’s biggest threat for the next six years may come from within. The ruling United Socialist Party of Venezuela is packed with capitalist interests. And as these politically powerful business people see their finances eroded by Maduro’s economic incompetence, it may force divisions, analysts said. In particular, many suspect that former Vice President Diosdado Cabello has his eyes on the Miraflores presidential palace. What is certain is that if Maduro wins the race, the international community will keep tightening the screws. Washington has already slapped more than 60 current and former Venezuelan officials, including Maduro, with financial sanctions. And it has suggested that more may be coming after the election, including a freeze on Venezuelan oil imports. On Friday, the U.S. Treasury slapped Cabello – along with his brother and wife – with sanctions, accusing him of money laundering and drug trafficking. VMejia, the opposition deputy, said that sanctions might not have an immediate impact but that they’re critical to keeping pressure on Maduro and his cronies. “In general, it is important that those who violate human rights in Venezuela, and those who have robbed our country and are responsible for the economic crisis, should know that they will not be able to enjoy their money and travel around the world freely,” he said.